My PaPa died on Thursday. It was his 82nd birthday. Having spent a significant amount of time with him at various points in my life, I wanted to remember and honor him. And the best way I can do that is to do the thing I enjoy, and write about him. 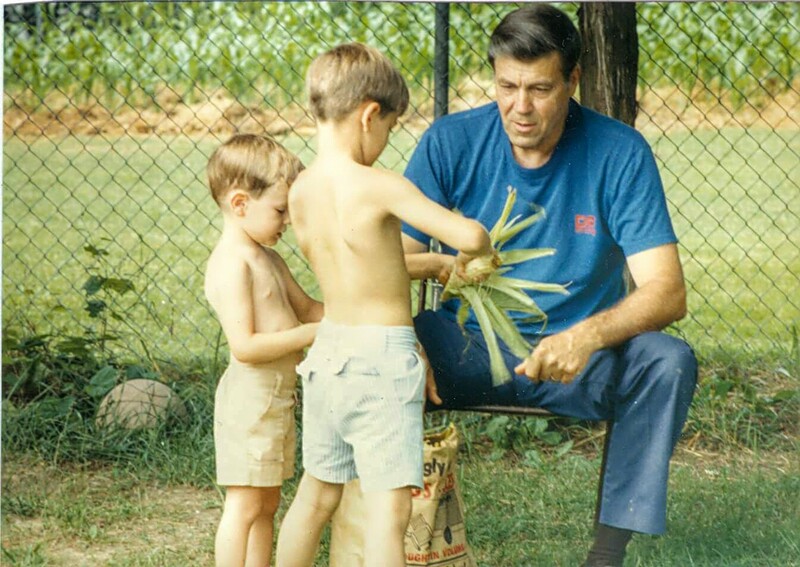 These are the 6 lessons I learned from my grandfather, Edward Bird. As a kid, I always admired my PaPa’s ability to lift giant rocks, move seemingly immovable objects, and work all day long on draining tasks. My hands would blister 15 minutes into a stump removal project, but he would unflinchingly smash away at the roots for hours until the remnants of the tree which we cut down the day before were fully erased. But he never flaunted his strength. You never saw him lifting weights or flexing or bragging about how much he could lift. He would just lift bags of concrete or multiple sheets of drywall without a word. PaPa’s subtle strength taught me that real strength doesn’t come from working the weights in the gym, but from working hard to better the lives of those you love. Those same hands that could fell a tree with a crosscut saw would also gently cradle his grandchildren and great-grandchildren. Anyone who knew PaPa for any length of time could see that he was essentially a hoarder. My amazement for his massive collection as a child turned to confusion and then suspicion as an adult. But I’ve often thought that there’s something I missed in my estimation of his copiously organized stacks of treasures in the labyrinth of his West Virginia basement. You see, PaPa didn’t collect what we thought of as junk simply because he needed it; he collected his prizes because he saw value in the stuff we see as valueless. He reminded his grandkids to take small bites of their food in order to savor every morsel. I’m pretty sure that he never missed a single sunrise. He took me and my siblings out to collect aluminum cans, teaching me that hard work can be fun and rewarding. He taught me that a dollar saved is a dollar earned as we labored over nail-filled 2×4’s until they were clean and ready to be reused. He was a Christian with an unflinching belief in his God. Some may have found his beliefs as odd or extreme, but he found them reliable and emboldening. He always seemed open to talking about what he believed. I’d like to think of PaPa’s faith as what supported him through years of loneliness and sickness. His God cared for him on the mountaintops and in the valleys. God strengthened his arms as a younger man caring for his family, and God strengthened his mind as an aging man in hospice care, remembering the word “baby” after we visited him. There’s something attractive about this simple faith. PaPa taught me that there are things worth believing in, even if it makes people uncomfortable. PaPa never seemed to struggle overmuch with adapting to new technology, but he had little to no time for innovations that would waste his time. I remember staying at Grammy and PaPa’s West Virginia home one summer. For some time we worked on a tool tote which we built from scratch. I often wanted to pull out the power tools, but he insisted that I learn how to use a handsaw. Then, instead of settling in front of the TV after a hard day of work, PaPa would go out on a walk. To him, walking the railroad tracks or hiking along a busy road brought him far more joy than any TV show ever could. His form of Minecraft was building sheds and toys and raised bed gardens. PaPa taught me to hold technology loosely and to find more meaningful ways to enjoy life. I get the feeling that PaPa would find the riskless society in which I’m raising my daughter as not very fun. I remember cutting down a huge tree in the front yard that required that someone pull the rope in the direction we needed it to fall. He was inevitably the one happy to stand in the path of destruction. He even more happily posed me as if I had been crushed by the tree when my mom came out to look. He enjoyed the thrill of taking his grandkids on hikes along a busy highway. And he built us the most incredible rope swing one time. I can hardly imagine my mom’s reaction when she returned home to see her pre-teen children hoisted dozens of feet in the air on the makeshift trapeze. Oh, but it was immeasurably fun. And I think he may have learned this from his dad. My mom told me that her PaPa (my great-grandfather) would shoot across multiple lanes of traffic while announcing, “you can’t live forever!” So the tradition lived on. PaPa taught me that an acceptable amount of risk always seems to pay off in the end. We live in an era of specialization. Most of us live our entire lives only learning a single trade. But PaPa and his generation were the supreme generalists. He could ride a bike backwards or draft an architectural or engineering model. He could construct just about anything as long as he was supplied with the proper amount of wood and nails. A veritable panoply of magic tricks came with him on every visit. He taught me how to cut sheetrock like a boss (a skill I did almost by instinct a couple months ago). He made his own cistern. He could build the best fires and lay a pristine pad of concrete. He could cut his own hair and do a little investing on the side. He cooked and canned food, often using food he raised in his carefully composted garden. He read frequently and did everything in life with a winsome attitude that would turn the most recent acquaintance into a friend. We’re all role models. We teach by our lives what is important and what is unimportant. We all mess up and emphasize the wrong things from time-to-time. PaPa and his culturally unique values are a reminder to me and my generation to reconsider what we esteem as the most important goals in life. Is a safe, single-trade, faithless, grandiose, technology-crammed life really worth living? Or is there something more satisfying to pursue during this fleeting journey?